January 2013 brings a report that Hangzhou now has 69,750 bicycles in 2,965 stations with 94,000,000 people riding the system annually. Yes, that is ninety-four million rides a year. If the system's owner, the Hangzhou Public Bicycle Transportation Services Development Company Limited, gets one yuan ($0.16 USD) for each one of those rides, well, it is a lot of cash. Now, if those riders need cash, Hangzhou Public Bicycle will make it easy for them! The company just reached an agreement to lease space at their bike stations to the Guangdong Development Bank for Automatic Teller Machines (ATM). Five of the ATMs are already installed according to Hangzhou.com. China seems to be leading the world in ideas of integrating multiple uses for their bike-sharing stations. This is a great example of synergy of services for the system's users. There are electric bicycle charging hook-ups at some stations in the city of Wuhan. Many Chines cities now have bike-sharing stations that double as bus shelters. The more attractions there are for bike-sharing users, the more bike-sharing becomes attractive and used. 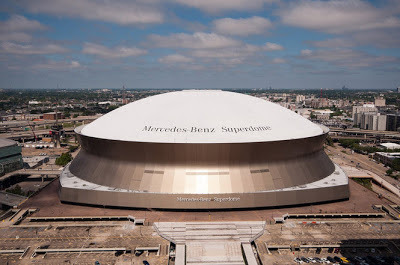 Bike-sharing will be making a pass to the over 70,000 spectators going to the Super Bowl in New Orleans, Louisiana. From January 30 through February 3, Entergy, Bike Easy, and the Downtown Development District are bringing B-Cycle to New Orleans so residents and visitors can try out bike-sharing while enjoying the Big Easy festivities for Super Bowl XLVII. 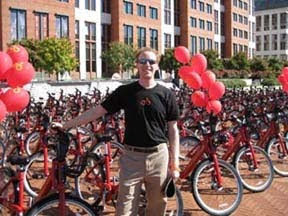 Both of the opposing football team's home cities, San Francisco and Baltimore are planning bike-sharing systems for 2013, so this will be good exposure for the sports fans. It also is a good way to excite the local residents to start a systems next to the mighty Mississippi. B-cycle will set up two stations and have bikes available at no charge. They hope that at least the first 49er users will start ravens about bike-sharing! Last week the Los Angeles basin got its first taste of multi-station bike-sharing. After a long waiting period, Bike Nation brought three stations into operation in Anaheim, California. Miami, Florida's City Council welcomed Decobike to travel across the Causeway from Miami Beach to set up stations in Downtown Miami. This system will probably be deployed fairly quickly. At the same time as Miami's City Council OK'd bike-sharing, so did Austin, Texas's City Council. They gave the non-profit organization, Bike Share of Austin the go ahead to deploy 400 bikes in 40 stations in this capital city of Texas. Since the residents of Budapest are starving to have Bike-sharing, Budapesti Közlekedési Központ (BKK) the consulting firm for the bike-sharing project, will sponsor another information session on January 30, 2013 for prospective vendors and operators . More information is at BKK. As 2012 was coming to a close, two of the most successful bike-share programs in Europe announced steep price increases of 100% or more for 2013! In October, Bicing in Barcelona announced membership policy changes and price increases of 116% according El País. In November, Barclays Cycle Hire in London announced doubling the price of daily, weekly and annual memberships according to the Times. A funny thing happened. The reaction in Barcelona by the Bicing membership was swift and strong. There was a demonstration, Save our Bicing, protesting the increase with a march on City Hall. Opposition by Bicing members and the bicycle community at large caused the city government to re-think the increase and ultimately changed the increase to only 3% (the consumer price index change for the year). This will start in February according to Bicing. While in London, there seems to have been very little reaction. Boris Bikers took the increases with the proverbial British, "stiff upper lip" and dug deeper in their pockets. The rate increase took effect on January 2, 2013 according to Transport for London. There were a few complaints on how the renewals were handled, but nothing nearing the reaction as in Barcelona. If there is a bright side to a 100% price increase in London, it is that the new one day rate of £2 ($3.20 US) is still less than a regular one way "Tube" or bus fare! In the daily web magazine Slate, January 7, 2013, the column, Doers: People who accomplish great things and how they do it, The Best Bike-Sharing Program in the United States: How D.C., of all places, made it happen, profiles fellow bike-share blogger Paul DeMaio as one of the prime movers and shakers that made Capital Bikeshare a reality. This is great recognition for Paul, his work and the The Bike-sharing Blog. Capital Bikeshare could not have happened without the work of many, many people in both Arlington County and the Washington, DC. Many are listed in this Slate article and in the Greater Greater Washington, January 9, 2013 article: Many unsung heroes made Capital Bikeshare a reality. Each and every one of them deserves a lot of credit. Thank all of you for making Capital Bikeshare The Best Bike-Sharing Program in the United States. There are a few cities though, that might take exception to which is the best! The Bike-sharing World Map is the #1 resource for bike-sharing systems. It shows new systems which come online which might not be covered in The Bike-sharing Blog. With over 3 million page views, it is known as the best way to keep up with the ever changing bike-sharing world.